U Electrolux Professional uređajima za završnu obradu možete birati iz velikog asortimana lako upotrebljivih, visokoautomatiziranih završnih glačala do osnovnih električno grijanih stolova za glačanje za manje zahvate ili za velike količine rada, ovisno o vašim potrebama. Osim što će podići produktivnost rada s rubljem, naši uređaji za završnu obradu osiguravaju najbolju kvalitetu završne obrade, odjevni predmet za odjevnim predmetom. Naše rješenje može uključivati neke od sljedećih uređaja: stolovi za glačanje, uređaji za završno sušenje i glačala za ovratnike i manšete. Electrolux Professional sustavi za završnu obradu hlača dizajnirani su za maksimalnu sigurnost pri radu. Opremu je također lako upotrebljavati, što omogućava korisniku obradu velike količine odjeće. Electrolux Professional višenamjenski uređaj za završnu obradu tako je učinkovit da jedan korisnik može obraditi do 40 jakni u jednom satu. Mikroprocesor jednostavan za korištenje može pohraniti do devet programa i kontrolirati sve funkcije. Otkrijte što naši uređaji za završnu obradu mogu učiniti za vaše poslovanje! 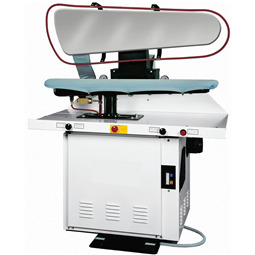 Foldable suction table with steam iron and small boiler. 850x380x250 mm. Adjustable height. 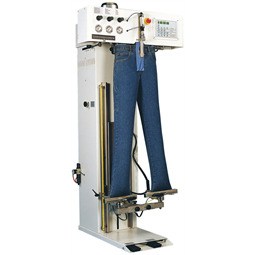 Trouser Conditioner for creased and uncreased trousers, with side-to-side waistband tension. 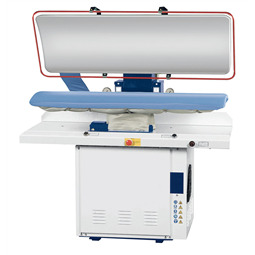 Garment finishing cabinet, total time for a full load 6 min. Steam boiler with electronic control. 3,3 kW for 5 kg steam/hr. 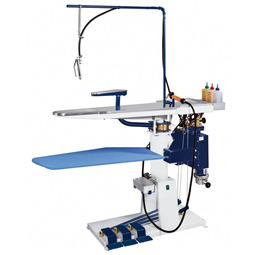 Multi-form finisher with tensioning devices for jackets, coats etc. 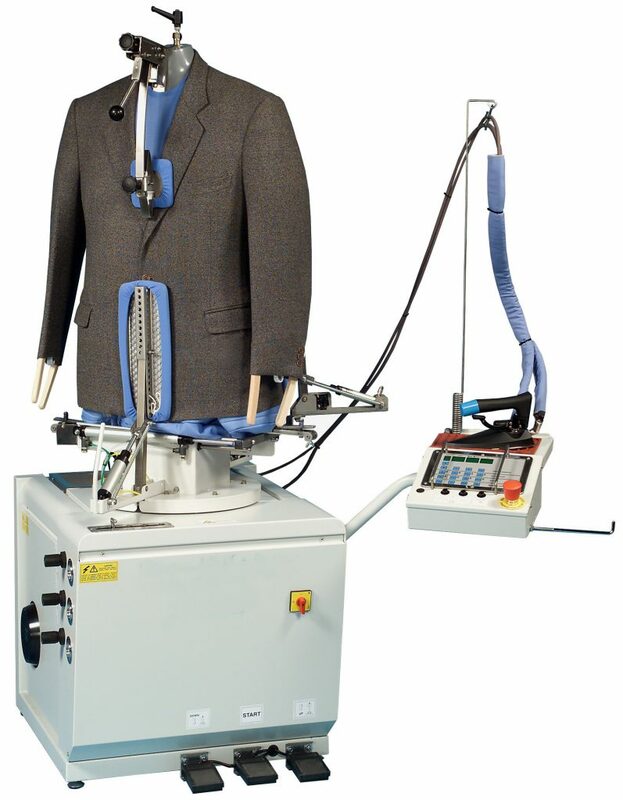 Suited for drycleaned garments. 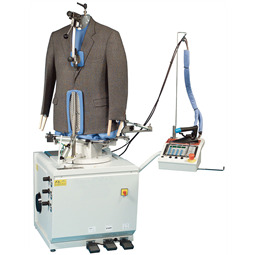 Steam air finisher for shirts, blouses and jackets, arranged for external steam. Cold spotting unit. 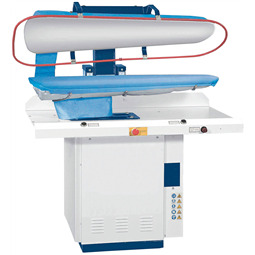 Two spotting guns with containers, stainless steel table and sleeve shape. Spotting cabinet. Cold spotting gun, air drying gun, spotting group with pivoting vacuum bucks. 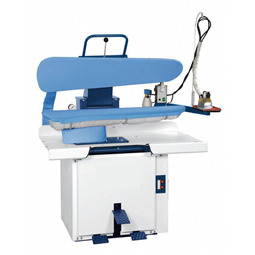 Utility vacuum/blowing heated table. 1300x500x250 mm. Adjustable height. 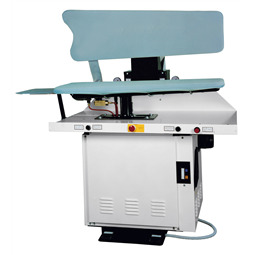 Utility shape, wet work press. Air operated. Steam heated. 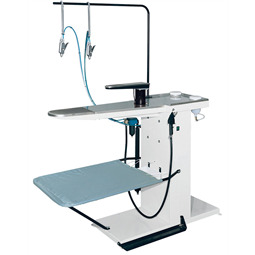 Utility vacuum heated table. 1300x500x250 mm. Fixed height. 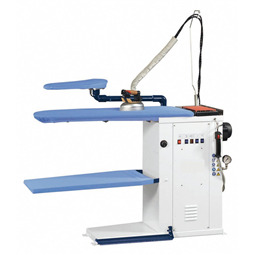 Utility shape, dry work press. Air operated. 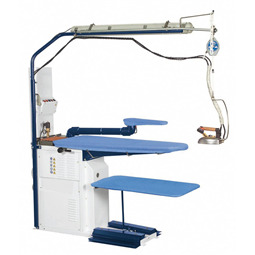 Utility shape, dry work press. Manually operated. 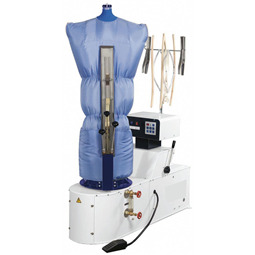 Steam air finisher for jackes, coats and dresses. 1 HP blower. Arranged for external steam supply. 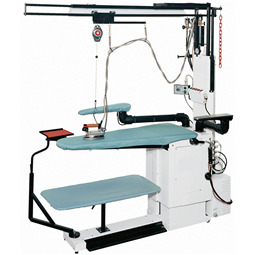 Multi-form finisher with tensioning devices for jackets, coats etc. 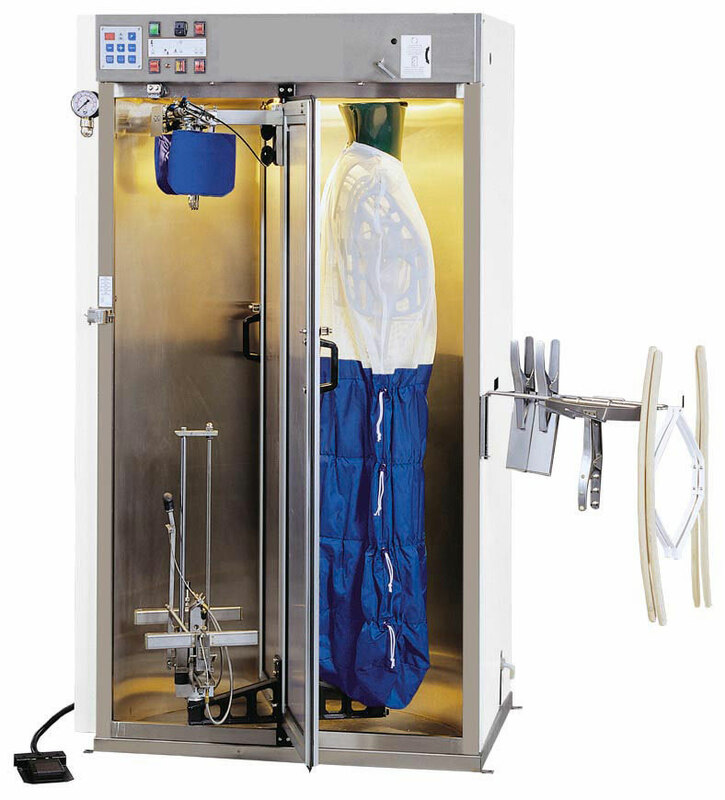 Suited for wetcleaned garments. 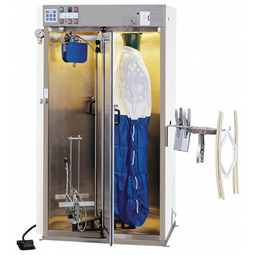 Utility, suction/blowing table with 6 kW built-in boiler. 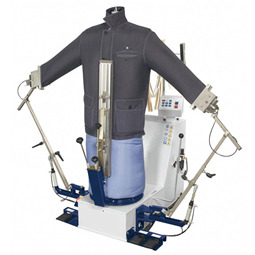 Suited for wetcleaning. 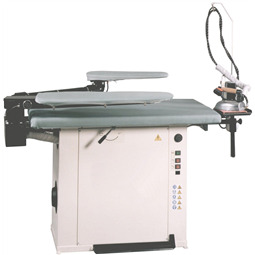 Utility vacuum heated table. 1100x380x230 mm. Fixed height. 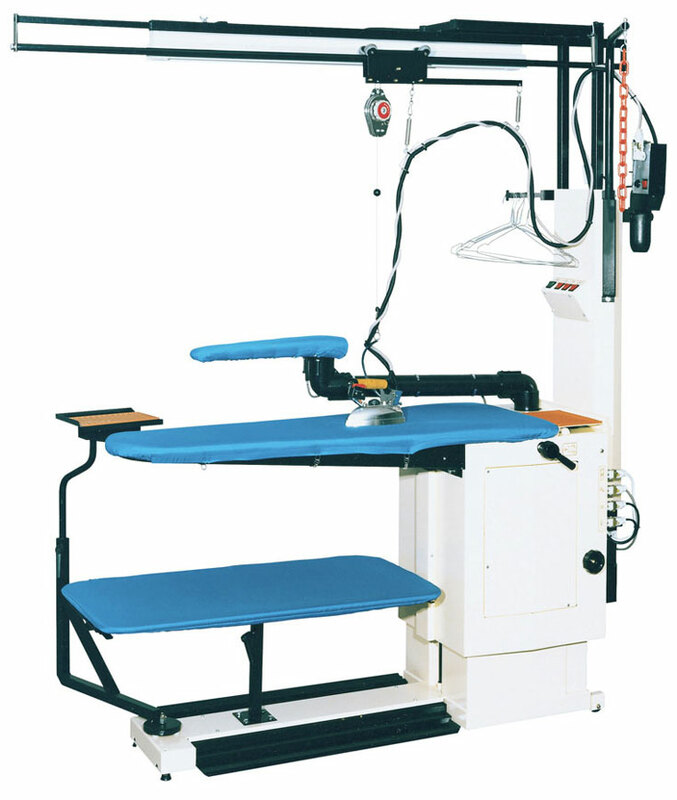 Steam air finisher for jackes, coats and dresses. 1,7 HP blower. Arranged for external steam supply. 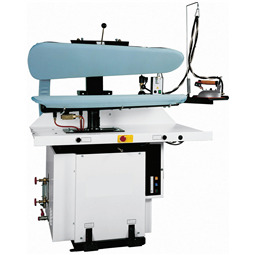 Steam air finisher for shirts, blouses and jackets with Built in boiler. Spotting table without any spotting gun. Ready to receive a steam or steam/air gun. 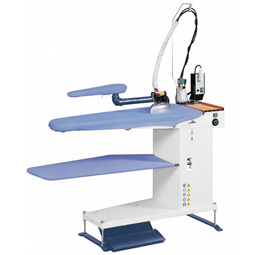 Utility vacuum ironing table, electric heated. 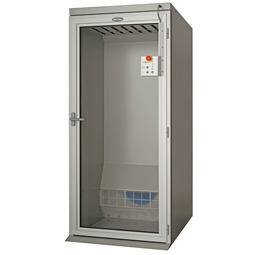 1300x500x250 mm. Adjustable height. Utility/leg shape, dry work press. Manually operated. Trouser Conditioner for creased trousers with front-to-back waistband tension. Rectangular, heated table with integral vacuum (no iron supplied). 1600x850 mm. Fixed height. 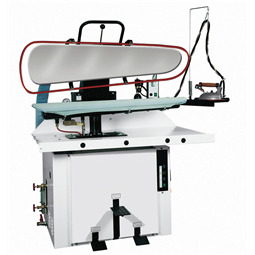 Rectangular shape, wet work press. Air operated. Steam heated. 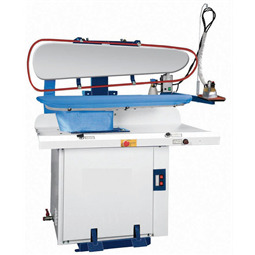 Electric steam boiler fully equipped for automatic operation. 10 kW for 13 kg steam/hr. Utility/leg shape, dry work press. Air operated. 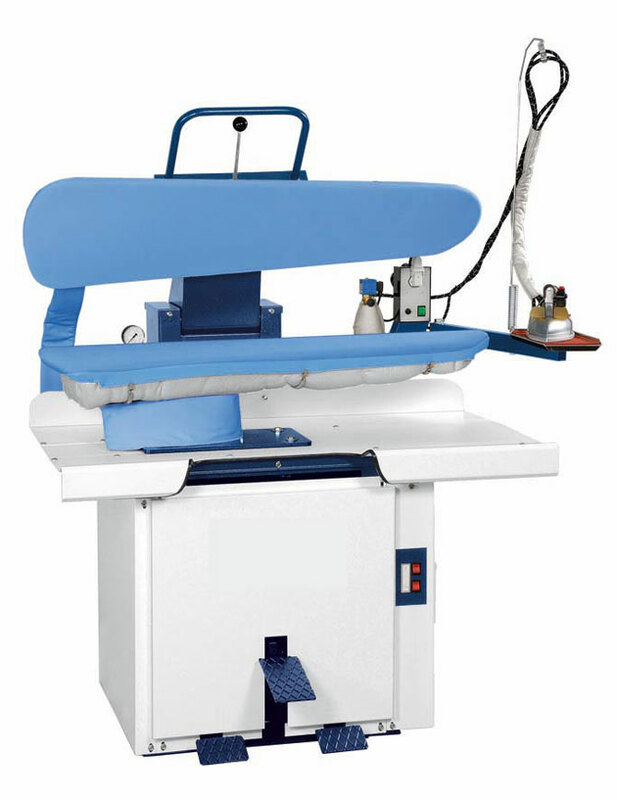 Steam air finisher for jackes, coats and dresses. 1 HP blower. Has integral steam boiler. Steam spotting table. 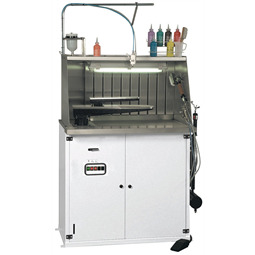 Foot operated steam spotting gun with various functions and drying gun. 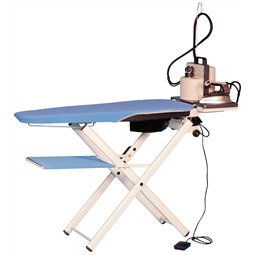 Utility vacuum ironing table, electric heated, with built in electronic boiler. Fixed height. Single leg shape, dry work press. Air operated. Single leg shape, dry work press. Manually operated. Rotary cabinet. 2x bodyform device. 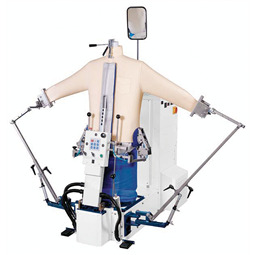 Each bodyform with four manual clamps and two sleevers. 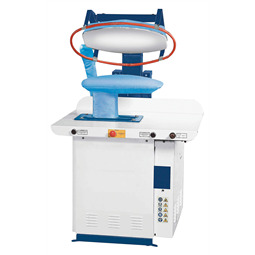 Utility shape, wet work press. 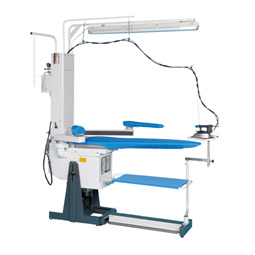 Air operated press. Steam heated. 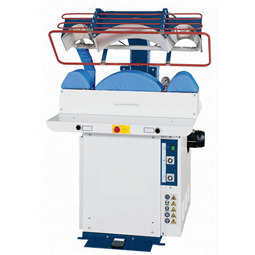 Electric steam boiler fully equipped for automatic operation. 12 kW for 16 kg steam/hr. Collar and cuff shape, wet work press. 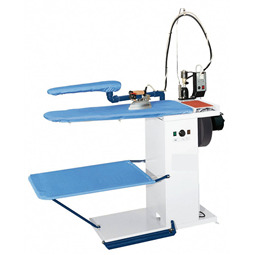 Air operated press. Steam heated. 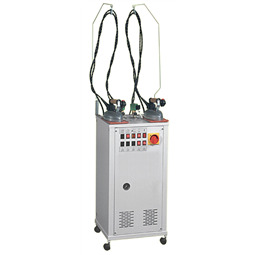 Electric steam boiler fully equipped for automatic operation. 15 kW for 20 kg steam/hr. 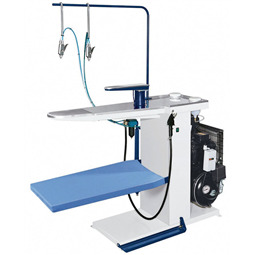 Utility vacuum ironing table, electric heated. 1100x380x230 mm. Adjustable height. Rotary cabinet. 2x trouser device. 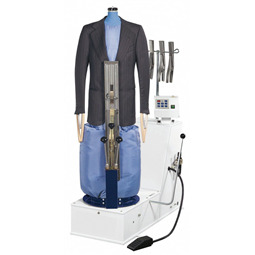 Each trouser device with single hand and two manual clamps. 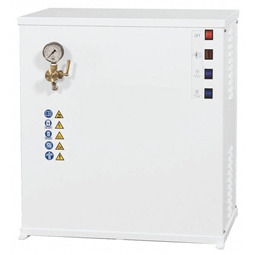 Steam boiler with electronic water level sensor, 13-25 kg steam/hours. 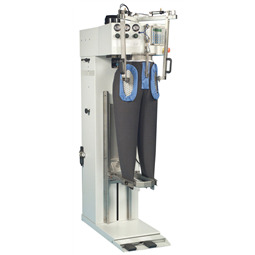 Utility/leg shape, wet work press. Air operated. Steam heated. 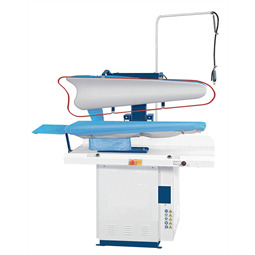 Utility shape, wet work press. Manually operated press. Steam heated. 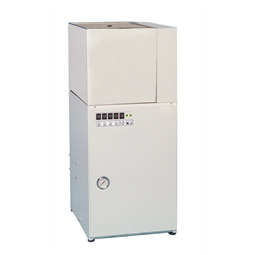 Electronic boiler with water feed/condensate tank for engergy efficiency. 18 kW for 25 kg/hr. Mushroom shape, wet work press. Air operated. Steam heated. Electronic boiler with water feed/condensate tank for engergy efficiency. 24 kW for 32 kg/hr.